the United States. 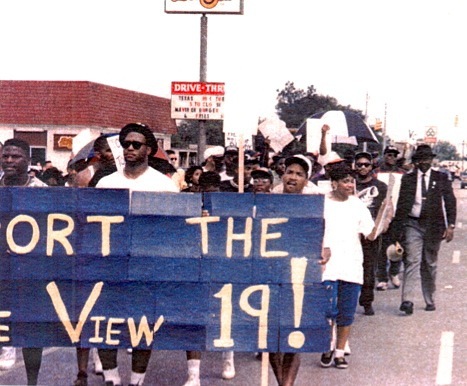 Protesting what they viewed as a county-wide effort to suppress their votes, students at Prairie View A&M University marched together toward a courthouse in rural Texas. “It was very reminiscent of the March on Washington,” says Joy Patterson, who was a graduate student at the time. She remembers bonding with the crowd as they walked in unison, and being “just amazed at how organized and passionate” everyone was. Prairie View A&M is a historically black college with a student body of 8,900 in Waller County, Texas, about an hour northwest of Houston. And the protests that spring from its campus are casting a harsh light on racial tensions that still exist in this part of the county. Waller County, says Frank Jackson, the mayor of the city of Prairie View “can best be described as ground zero in the long march for slavery to freedom here in Texas.” Indeed, the state’s large-scale slave plantations had their origins in Prairie View, and the campus itself was built atop a former cotton farm. Originally named the Alta Vista College for Colored Youths, it opened in 1878 with just eight students. Jackson says race still lurks beneath the surface of many of the county’s political and economic decisions. And with allegations of voter suppression across the country on the rise this election season, Prairie View’s story is food for thought. The trouble leading up to the 2008 march all started when Waller County, citing budget concerns, cut its number of early voting locations down from six to one, leaving the county courthouse — some seven miles from Prairie View — as the sole polling place for the county’s 30,000 residents. Students, many without access to cars, were vocally upset about not being able to vote closer to campus. The long trek to the polls would hinder many students from participating in the election at all, they argued. So they sprung into action. Congress. They caught he attention of the U.S. Justice Department, which agreed to launch an investigation into the county’s decision. But most notable was the grassroots effort. They acquired the necessary permits from local police and fire departments, constructed signs and banners with messages like “Vote or Die,” and launched a community-wide ad campaign to spread the word about their plan – to march from campus to courthouse. In a surprise move on the eve of the protest, the county commissioners’ court agreed to provide three additional temporary polling places, one of which would be located a mile from campus. The students marched anyway – straight down the major highway in town, jamming traffic for 50 miles, all the way down to Houston. While it’s impossible to directly link the court’s decision to the impending march, it’s hard to argue the students’ activism didn’t play a role in the reversal. 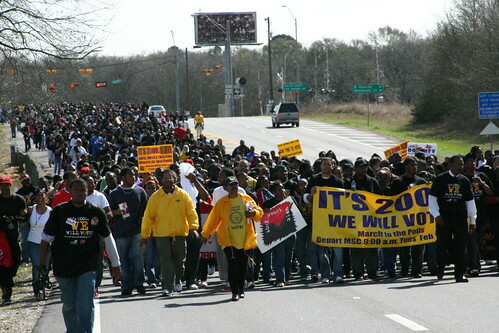 It wasn’t the first time Prairie View A&M has spoken out in the name of voting rights. In 2004 — nearly a quarter century after the U.S. Supreme Court ruled college students could, in most cases, vote in their campus precincts — former Waller County District Attorney Oliver Kitzman publicly challenged Prairie View students’ right to vote, accusing them of skewing election results at the expense of permanent residents. Some 2,000 students and supporters marched that year, and after the U.S. Justice Department stepped in to investigate, Kitzman dropped his efforts. 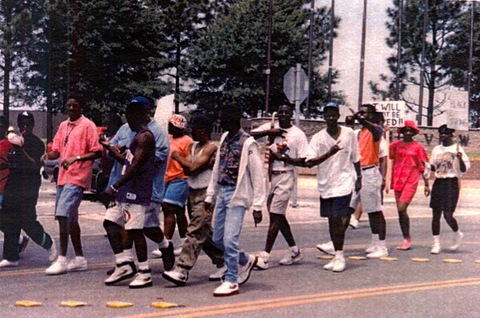 And in 1992, after 19 Prairie View students were indicted for improperly voting, the school rallied around them, marching in support for the so-called “Prairie View 19.” Jackson, who was involved in planning the logistics for all three of the school’s major marches, says the ’92 march caused a lot of discourse in the community. “We had haters,” he recalls. “One lady said we should be horse-whipped.” All of the indictments were all eventually dismissed due to lack of evidence. So why does all this matter in 2012? For starters, it’s clear that longstanding tensions between the student body and the neighboring towns remain. welcoming,” says Priscilla Barbour, chief of staff for Prairie View’s Student Government Association. A petite, charismatic political science major from Dallas, Barbour has been working on voter registration efforts with the Texas League of Young Voters, knocking on dormitory doors and sponsoring events like comedy shows where students can register on site. But when the League asked her and her fellow students to canvass in the surrounding areas, they said no. “We didn’t feel comfortable going out in some of the whiter neighborhoods,” Barbour said. Today about 80 percent of Prairie View’s student body is African-American, and at school, students are taught to thrive in the society they live in. Prejudices only teach her to work harder, Barbour says. She plans to become a community organizer after graduation next year, and hopes that future generations of students are able to build a healthier relationship with county officials. In the short term, there’s more to be done when it comes to making sure students go to the polls to vote once they’re registered. In past elections, even though some 80 percent of students have been registered, a lower percentage have actually turned out. The school’s popular “No Voice, No Vote” campaign, which features a mosaic of photographs and videos of students and campus officials posing with black tape covering their mouths, is meant to illustrate to students that people who stay home on Election Day don’t get a say in the outcome. “It’s small things like that campaign that ignite passions in people,” Barbour says.